These awesome SANTA ROSA Engineer Boots featuring deadstock original O'Sullivan green half soles were recently sold by our friend Zip Stevenson of HTC (Hollywood Trading Company) fame. Part of a truly limited edition project, only 10 pairs are being produced and offered (5 pairs already sold) due to the limited quantity of new old stock 1940's-1950's green O'Sullivan soles from Zip's collection that are being used for this limited run. N.O.S. vintage O'Sullivan half sole. Of the 10 pairs available that were initially available, I am informed that 2 pairs are now sold to a client of Zip's in Spain, 1 pair to another client in Germany, one pair to another in Orange County So. Calif. and yet another pair now calls Toronto its home, leaving 5 pairs remaining at the time of writing. These boots can be constructed in a full range of sizes ranging from 7 to 12. 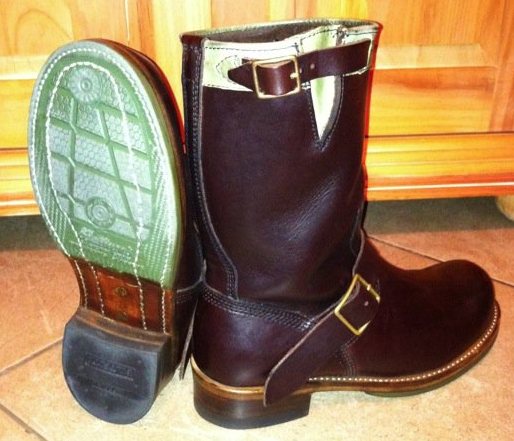 The boots include four stitches on the counter pocket, three stitches in the vamp, and triple stitched back spine. They are available with either hard or steel toes and solid brass (or heavy duty stamped steel buckles with nickel plating) instep and calf buckles. The interior vamp is leather lined (nice touch). The top of the shaft comes with a separate rolled, green leather collar. The boot features leather "Goodyear Welt" standard sole construction with optional storm welting available at no additional charge. They come standard with triple ribbed hardened "steel shank" arch supports that are secured to thick "12 Iron" leather outsoles with twin solid brass, semi tubular rivets. 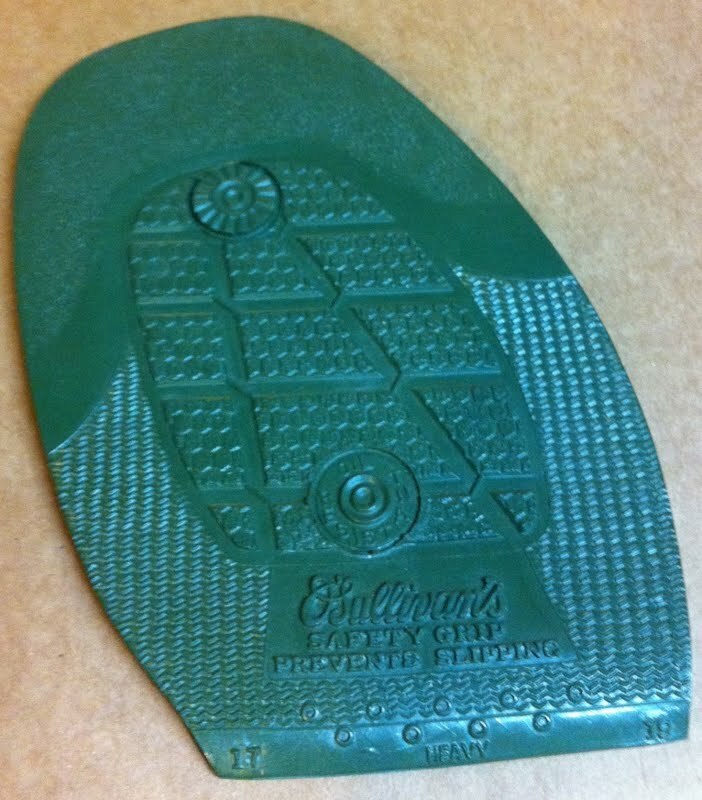 The heel cores are made from stacked leather and the rubber heel cap is the nail down washer type. Even the heel rand is made from leather. Zip uses Latigo type leather that he offers in choices of light, medium or dark brown in addition to black. I'm told that the Latigo leather ages quickly to a very nice patina. Priced at $995 per pair which reflects the thought, experience, time and materials not to mention the love invested in to making these heirloom quality, limited edition beauties. With boots like these, when you're done with them you can hand them down to one of your grand kids that's interested in classic British made motorcycles e.g. Triumph as these boots are made to last! Interested parties may contact Zip via his Facebook page or contact the fine folks at the Hollywood Trading Company retail store in Los Angeles, California. The first rubber heel for shoes was patented on January 24, 1899 by Irish-American Humphrey O'Sullivan. O'Sullivan patented the rubber heel which outlasted the leather heel then in use. P.S. 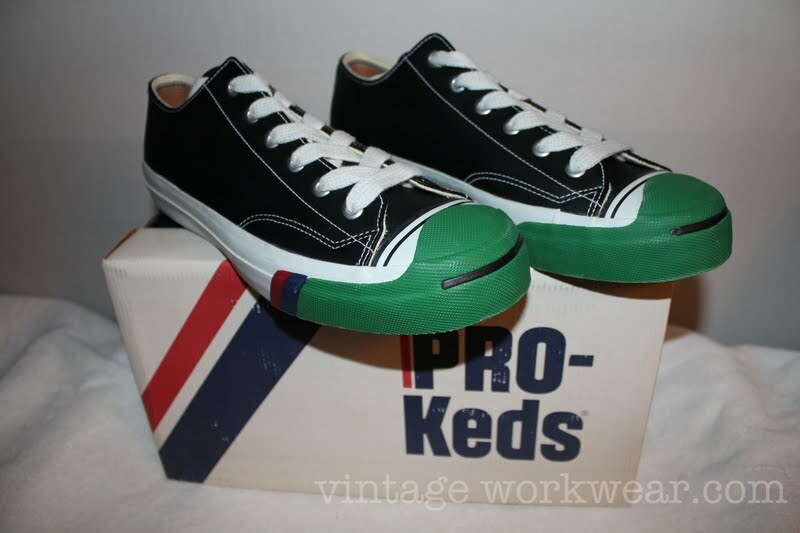 One of the reasons that these boots first caught my eye was due to the unique green sole that reminded me of a pair much favored PRO-Keds that were re-released some 8 odd years ago with green toe cap, shoes that I still wear to this day. NOS PRO-Keds from the upper reaches of my closet. Why does everything I want cost so much????!!! Nice boots! That's one of the drawbacks of having good taste. Not the worst problem one could have my friend!